Each ELISA kit consists of coated plate and ready-to-use solution. No special handling required, simple operation. CUSABIO ELISA kits cover more than 20 species with broad research areas to meet a wide variety of needs. 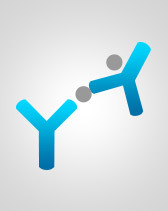 CUSABIO selects high-quality antibodies as the raw materials of ELISA kits, which ensure our kits have higher sensitivity generally. 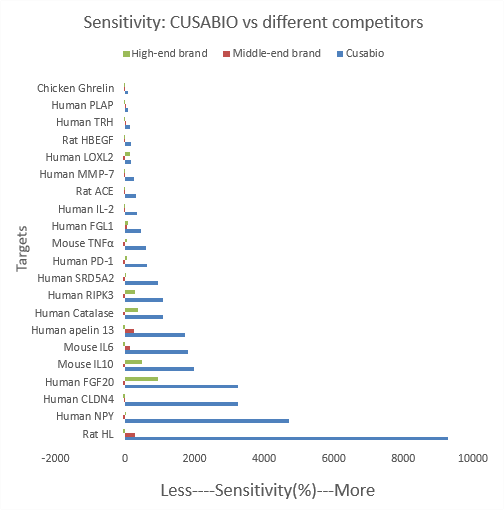 We randomly compared CUSABIO ELISA kit sensitivity with different competitors' assay across 21 popular protein targets and calculated the ratios. CUSABIO ELISA shows superior sensitivity. The results are shown in the figure below. The ELISA kits are validated in multiple biological samples: serum, plasma, body fluids such as urine, cell culture supernatant and cell /tissue lysate. Food safety has become a global issue because it affects the health of everyone. CUSABIO also developed a series of ELISA kits for food safety& drug Residues such as: Gentamicin (GEN), Kanamycin (KA), Aflatoxin, and so on. We provide replacement product or refund if the product doesn't perform as promised in the manual. Read more.